To begin, lay the construction paper and tissue paper out in front of your little artist. Encourage them to rip and tear the paper into different sizes and shapes. Help the smallest artists (18 months – 2 years) rip paper into pieces smaller than a business card. After your little artist has create a pile of ripped construction paper and tissue paper, give them a single sheet of card stock, in bright green or any other bright color. Give your little artist a shallow bowl and fill it with glue. Show your little artist how to dip the pieces of torn and crumpled paper into the glue and then place them on the page. There is no right or wrong way to add paper to the page, little artists can spread the pieces out across the page or layer them one on top of another. When the glue has dried, use the green marker to add stems and leaves to the “flowers” that your little artist created. You will need to draw the stems and leaves for the smallest artists, more mature preschoolers may want to draw their own. This project provides a great opportunity to create collages that grow off of the page. To make three dimensional flowers, show your little artist how to crumble tissue paper into a ball, fold pieces of construction paper and only glue one edge to the page, or curl construction paper into cylinders. More mature preschoolers may want to work beyond the concept of spring flowers. One student in my class created a frog from pieces of dark and light green torn paper with tissue paper eyes (fourth collage on the second row below). Encourage little artists to play, explore, and imagine and they create their spring flower garden. 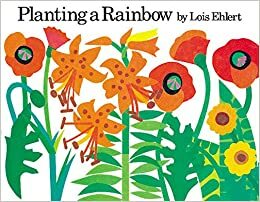 Before or after your torn paper collage project, read the book Planting A Rainbow by Lois Ehlert together with your little artist.